The Mountfield SP414 is the ideal power drive petrol rotary mower for use on small lawns. This easy to use mower has a lightweight, rust resistant polypropylene cutting deck which helps to keep the weight to a very light 19.5kg. The SP414 is powered by a Mountfield 100cc SV four stroke engine running on unleaded petrol. The engine is easy to start, economical and has a low noise level. This mower is power driven. 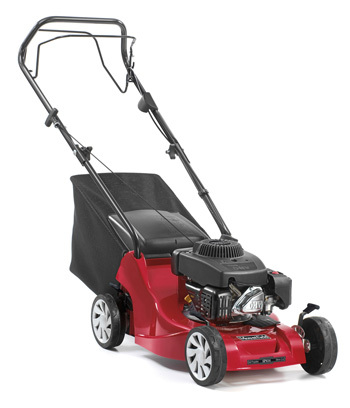 The Mountfield SP414 has a cutting width of 39cm/15.6 inch and is suitable for cutting lawns of up to 20 metres x 20 metres or for trimming areas of larger areas of grass that cannot be cut by a ride on mower or larger rotary mower. The power drive makes it easy to cut lawns which have a slope or uneven turf. Cutting height can be adjusted from 25mm to 70mm in five pre-set positions. Grass cuttings are collected into a 40 litre capacity canvas collector. The handles can be folded to save space when storing this mower and it can be lifted into a car without trouble. The Mountfield SP414 is a practical alternative to an electric mower offering more power, greater clipping collection capacity and freedom from the dangers of trailing cables. The lightweight and power drive move this mower along effortlessly and combined with its easy starting engine, using the SP414 is convenient and stress free. Best of all, its all for a great price. Do not forget that Randells supply this mower ready for use. We supply Mountfield products fully assembled, ready for use and personally delivered by one of our garden machinery specialists who will install the machine and take time to explain its operation. We provide full warranty, service and spare parts support for the Mountfield equipment we supply. As Mountfield dealers, we are responsible for all aspects of the sale and the contract governing the sale and support for the Mountfield products we offer. In view of this, we only supply Mountfield equipment to customers resident in Norfolk and the Waveney valley area of Suffolk. We will consider part exchange of your used garden equipment against the purchase of new Mountfield machinery. Already have a Mountfield mower and need a spare part? Contact us on 01603 738635 or 01362 699888.